Cake is a food that must be placed in order to be eaten. Cactus cake does not drop anything when broken. Cake is crafted using three buckets of milk, two units of sugar, an egg, and three pieces of wheat. Note: The buckets of milk are returned as empty buckets when the cake is crafted. This makes it renewable. 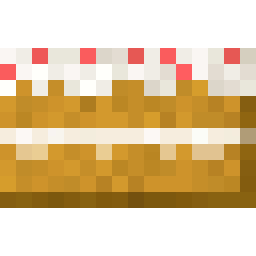 Unlike most food items, cake can't be eaten directly in the inventory. Instead, it must be placed on the ground first. When placed, it can be eaten by the player by shift-clicking. This removes one of the seven "slices" of the cake, causing it to change its graphic. It gives the player back two hunger points and an extra half a heart. Cake has 7 uses in total. Cake is required in the crafting recipe for cactus cake. 25 Make a Cake. Make a cake. This page was last edited on 28 March 2019, at 16:35.